This cupcake insert keeps six of your colorfully, creative cupcake masterpieces safe and secure during transport. Designed to hold a standard sized cupcake, the 6 cupcake box insert is ideal for special orders and take-out pastry shops. 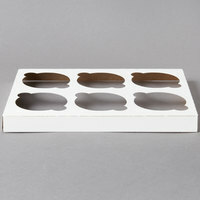 It can also be used on either the white or kraft side to match your bakery box for a clean, professional presentation. For larger orders, combine multiple inserts and bigger boxes to package 12 or 24 cupcakes. I ordered the box and the cupcake stand, and both fit perfectly in size, I am very pleased. Muffins look very attractive. Thank you so much! I'm a self taught baker and have a baking business. This inserts kept my cupcakes sturdy during delivery. I can put six cupcakes in the appropriate sized box and they stay in place, no more smooshed frosted toppings. I love this cupcake insert! I like that is white on one side and natural kraft on the other because I use both for packaging cupcakes depending on the order. I will say that the natural brown side isn't very grease proof but the white side is. Either way I think this product is still a great value. I really like these cupcake inserts for my smaller orders. They are sturdy and work well for my needs. My cupcakes fit in them nicely. These are good and sturdy cupcake inserts and fit perfectly into the 9" x 7" x 3 1/2" White Auto-Popup Window Cake! i will be purchasing the bigger pack! i bought these when having a bake sale at a local food pantry, they were very easy to fold and insert into the 9''x7'' cake box. they held the cupcakes in place very well. they looked very professional. will definitely order more when more are needed. Great inserts for holding standard size cupcakes to prevent them from moving around. They do go up higher on the cupcakes than other ones I have used, so you either need to cut them down or be a little extra careful when putting the cupcakes into the box. Overall, they get the job done and are a great value. These are a great price and do the job. The height is also good for standard cupcakes. inserts hold their shape well (in the box) and the cupcakes and be removed easily. I Love these cupcakes inserts. I can use it in two different colors; brown or white. They are sturdy and keep my cupcakes in place. These 6 cupcake inserts are great and make transporting cupcakes so much easier and gives you peace of mind! They are very nice quality and I would definitely recommend for whoever is looking for inserts! Thus cupcake insert are great especial for large boxes. Since the pack will in 14 x 14 boxes. You can also tape them down to thee box to keep them in place. Very sturdy and easy to use cupcake insert! I use these to hold my cupcakes and muffins in the 9x7x3 1/2 pop up box. I also use these inserts in my display case for the farmers market. They keep everything up right and in place during transport to the market. These inserts are the perfect size for our muffins. They hold up well, sturdy. We highly recommend this product. We are fixing to order more. Great sturdy quality, much better than you would purchase at a retail store. Cupcakes fit in perfectly and they are not too deep as some are. Will continue to buy and use. I use these inserts for 6 and 12 cupcakes in the bigger box, they work great, very sturdy, great quality, will definitely buy them again! This fit perfect on my 14x10 quarter sheet cake boxes! Cupcakes are protected when transporting. I like to use them with the Kraft side showing to match my boxes! This 6ct cupcake insert works wonders. It allows me to transport many cupcakes without having to worry about them getting jostled about. It can also be used in a quarter sheet cake box by using two of them for 12 ct cupcake delivery. These shipped quickly, easy to store, easy to fold, easy to use! Exactly what i needed for my new baking business! I have gone through 400 of these so far and need to order more!! These held my cupcakes perfectly. They fit into the box exactly how I needed them to. I would definitely purchase them again. Thank you Very much! These cupcake inserts are perfect for my cupcake business, SugarTherapy by Ronnie! Not only are they great at helping me transport my delicious treats to customers, but the inserts provide a very professional detail. I will definitely stay stocked up! The cupcake inserts fit perfect in the boxes and are very easy to put together. They are durable and love that they are two different colors. Will definitely purchase these again. I love these cupcake inserts! Keeps my cupcakes in place and I don't stress as much when I'm making deliveries. It also makes a great presentation! These are greaty quality! I have a very small home based cupcake business and these are a lifesaver for keeping costs low! They are very sturdy and hold the cupcakes and hold the cupcakes in place. I have even traveled 4 hours and every cupcake made it's destination in perfect condition thanks to these inserts. I must have to keep your cupcakes upright in your cake box! Loves he 6 ones over the 12 ones! Buy them by the case, webstaurant makes been a small business very affordable! No more smashed icing and hard work gone to waste. Just put your inserts in a bakery box and away you go. It is a nice presentation for homemade goodies. These are my favorite product. You can't beat the price and quality. They fit in a 1/4 sheet box or a 1/2 sheet. They are very convenient to use and keep my cupcakes well-spaced and safe for travel. When I ordered, I wanted the 12 count holders but they were out of stock. The 6 count worked fine. They just took a little more time but used the same amount of space. The cupcake inserts are sturdy and fit nicely into the boxes. I've looked at other sites for the same cupcake inserts and WEBstaurant store is by far the cheapest! Works well to separate the cupcake from each other....great tool to have...easy enough that you can cut to the size of any box. Great value for the quantity you get. These are a MUST for every cupcakery. They keep my cupcakes safe and in place when traveling. They match the box perfectly too. You can use these for a box for 6 cupcakes or a box for 12 cupcakes. Used to purchase 6 cupcake inserts someplace else however found these for half the price! They work great, no difference in quality fron the higher priced ones. Highly recommend! These are great paired with the 14x10x4 cake boxes they sell. They come easy to store in their packaging, easy perforations and keeps the cuppys very stable, especially during those important transportations! These are invaluable when transporting cupcakes. They are great value and worth every penny. I would definitely order these again. It makes the presentation look great. These are pretty sturdy. I enjoy that it separates the cupcakes, unlike most boxes, so the cupcakes do not shift around during travel. Also, I think the cardboard is more classic than the plastic. Love these cupcake inserts! Two of them work great in the 10x14 box and four of them work great in the 14x19 box! Great way to transport your cupcakes or box them for customers! I purchased these inserts along with the window boxes to display my cupcakes at a vendor show. They were so easy to slide in and held my cupcakes in place for the 2 hour drive. These inserts are good for holding cupcakes in place! Prevents cupcakes from falling over and smashing up against the box! Nice inexpensive price that keeps the beauty of each cupcake in tact!!! We love these inserts. They are reasonably priced fit nicely in 14x10 or 19x14 boxes. You won't have to add a lot to the cost of your cupcakes. These are GREAT! I love the option to either have 12 or 6 cupcakes. The 12 fir perfect in the 14" x 10" bakery box. All my cupcakes get to their destination without any mess. Very easy to put the boxes together. Easy storage. Easy to use. Love it. Perfect cupcake take away storage. Keeps them fresh and moist. would recommend. Good product for what they are for. I used them once so far, but need to give them another shot. They didn't stand up n place and I lost my icing but otherwise was great because the cupcakes didnt slide in the box. I recently made 200 cupcakes for a wedding and was able to transport them 1 hour without incident thanks to these inserts. Will definitely be buying more! Wish the holes were a tish smaller for standard cupcakes...but other than that they are great! !Will for sure reorder this item again and recommend to others. The boxes work great for my smaller orders. I also bought the size that will hold the inserts to hold up to 12 cupcakes. Works wonderful for transporting and holding cupcakes. These cupcake insert holders are the best. It made it so easy to transport cupcake. Now i have no worries about my customers cupcakes making looking intact when they arrive to there destination. These are a great way to transport my cupcakes for family, friends, and special orders! The only thing I wish is that the holes were just a tad bit wider. These have worked very well for me. Super easy to use and holds the cupcakes perfectly. The only reason I did not give it a 5 is that I wish 2 would fit in a 12 x 12 cake box. Other than that they are great! This are the perfect professional touch to your cupcakes. You don't have to worry about toppled over frosting messed up cupcakes when transporting with these liners. They are worth every penny! This is a handy product and a cheaper way to transport cupcakes than buying specially made packages. I would recommend this. It takes a little time to attach to boxes, but can be worth it.